We took Muffin to a birthday party last Saturday, where they did crafts and other fun things. At the end of the party all the kids that wanted them could get tattoos. 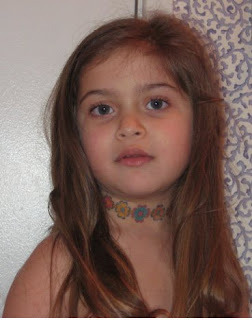 So what tattoo did my daughter pick and, most important, WHERE did she have it placed? (see picture for the answer). Sigh. We're in for a world of trouble once she gets to be a teenager!! She is so beautiful!! /lol at the tattoo placement. Maybe if you give her a whole lot of fake ones she won't want a real one later on.